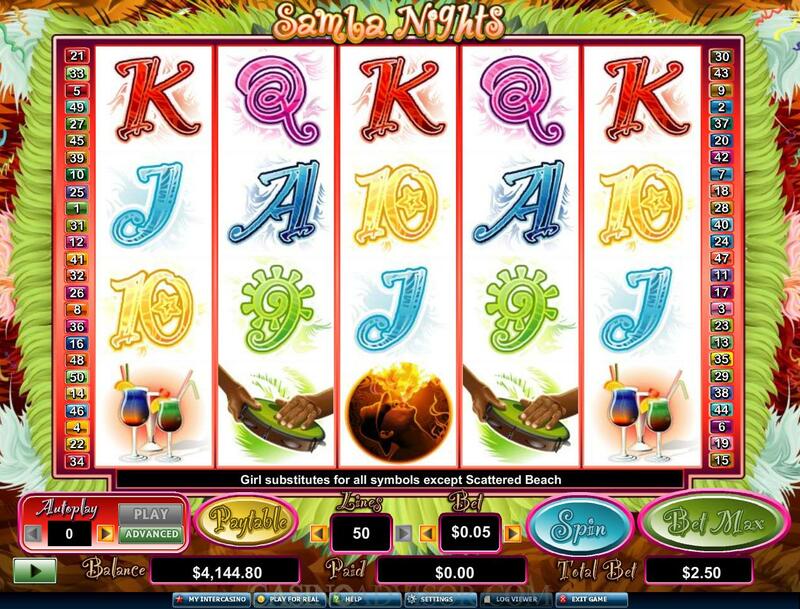 Samba Nights is a video slot from Cryptologic. It has 5 reels, 50 paylines and a maximum bet of 50 coins. Another unique feature is that each reel displays four symbols instead of the usual three. Samba Nights is based on the carnival theme. The carnival atmosphere is created through bright colors. The reels are set in a background of colored feathers, which are seen in the costumes of the Samba girls. The Samba Girl is the wild symbol. 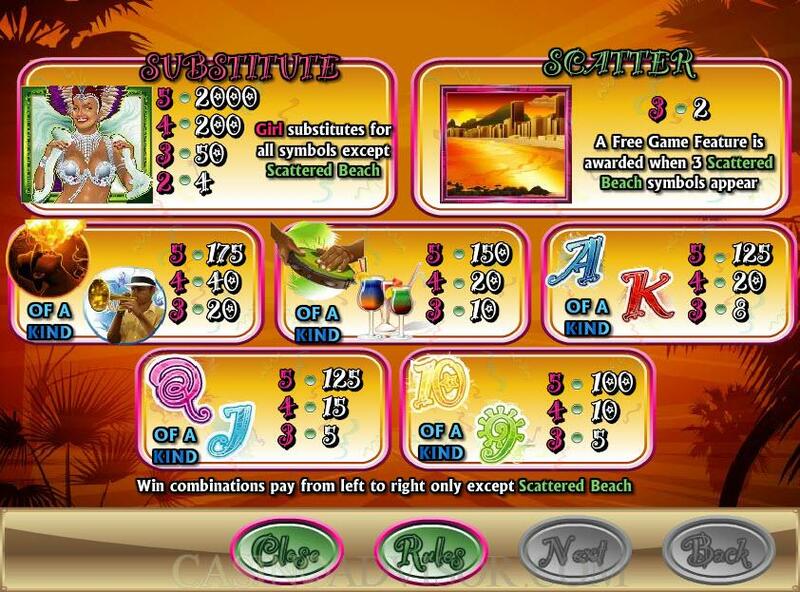 The Beach is the scatter symbol and it triggers the free spin bonus round. The other symbols are also taken from the carnival. They are the Fire Eater, the Trumpeter, the Tambourine and the Cocktails. The high card values are also brightly colored and styled in festive fashion. Before starting the game players will have to choose the coin denomination by operating the arrows on either side of the coin denomination button. Coin denominations show an amazing degree of flexibility. There are 11 options between 0.01 and 1.00 and then the denominations increase in increments of 1.00 till 20.00. Players will also have to enable up to fifty paylines. The paylines can be activated by operating the arrows on either side of the LINES button. All fifty paylines can be selected by clicking on the Bet Max button. Winning combinations pay only if they occur in enabled paylines. 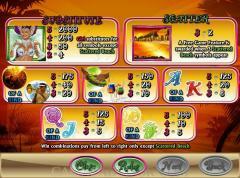 In Samba Nights players can wager only one coin per payline by default. But this is hardly a problem because the coin denomination range is suitably larger. Once the settings have been completed the game can be started by clicking the Spin button. The Samba Girl is the wild symbol. It doubles payouts when it substitutes to make a winning combination and offers a fixed jackpot of 2000 coins when five Samba Girl symbols appear in an enabled payline. The Beach is the scatter symbol and it appears only on reels 2, 3 and 4. Three scatter symbols anywhere on the reels result in scatter payout of 2 times the total bet. Three scatter symbols also trigger the free spins bonus round. 20 free spins are awarded and they come with doubled payouts. If three scatter symbols again appear during the free spins then the round is triggered again. The free spins are played at the lines and bets selected in the triggering bet. 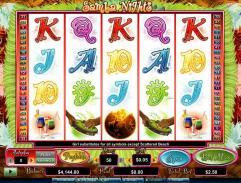 Samba Nights is a slot suitable for high rollers. At the highest coin denomination of 20.00 the maximum line bet is 20.00 and the maximum total bet is 1000.00 per spin. The maximum line payout is 40000.00 and the maximum scatter payout is 2000. Interested in reading more detailed information about Samba Nights? If so Click Here for more details.